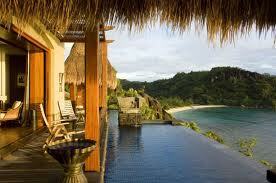 There are just four villas on L’Union Estate, right on the beach, among gardens and coconut palms. Each has two air-conditioned double bedrooms with en-suite bathrooms, a large sitting/dining room, fully equipped kitchen and a balcony, from which you can look west across to Praslin, or watch the sun set over the Indian Ocean. The estate is closed to the public at night, so it’s very peaceful. The resort’s 30 villas are set among tropical flowers and palms in the undulating grounds, which give them the maximum privacy. Generous terraces with panoramic views include dining areas, day beds, outdoor baths and private, infinity-edged swimming pools that seem to merge with the Indian Ocean below. Located among mango and coconut trees with spectacular views of the ocean, the Château de Feuilles has nine rooms divided between the château and various thatched bungalows built of local architecture. It is a member of and offers activities such as sailing, fishing, diving, snorkelling and trips to nearby islands. Designed in the style of a village, the 67 villas resemble private residences, spilling dramatically down a forested hill on the southwest coast of Mahé. Some are perched high up in the hillside, others nestle closer to the beach, all offer the utmost privacy, giving the impression that you are totally and blissfully alone. 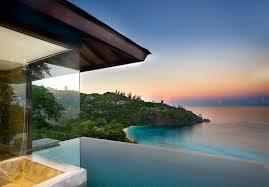 Frégate Island Private was the pioneer among these nature reserves combined with resorts. It’s large enough to ensure that even if you stay a week you can take a different walk each morning, through dense forest, over bare upland terrain with thousands of seabirds wheeling overhead, along the coastline above the island’s seven beaches or through groves of coconut palms beneath which the tortoises graze ceaselessly. Located on the southern tip of Beau Vallon, this well-established Mahé hotel was restored in 2004 and features granite walls, thatched roofs and a maze of fountains. There are 68 rooms and suites, decorated in contemporary or Creole style. 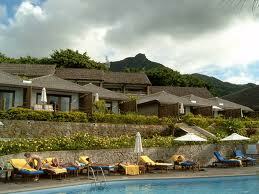 Located at the northern tip of La Digue island, Patatran Village offers good accommodation at a slightly lower cost. Each villa is detached, with a bright air-conditioned double bedroom, bathroom, and fridge, plus large sliding windows on to a private balcony overlooking Anse Patates. The hotel buildings are exquisitely pretty in the Seychellois French-colonial style, with steep-pitched roofs, white-painted wood, trellising and frilly fretwork along the eaves. 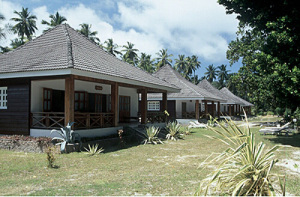 There’s an excellent chef, nice and motherly waitresses, and a spa in the old plantation house overlooking the beach.